Blue Whale Shark necklace , whale shark tattoo design pendant. 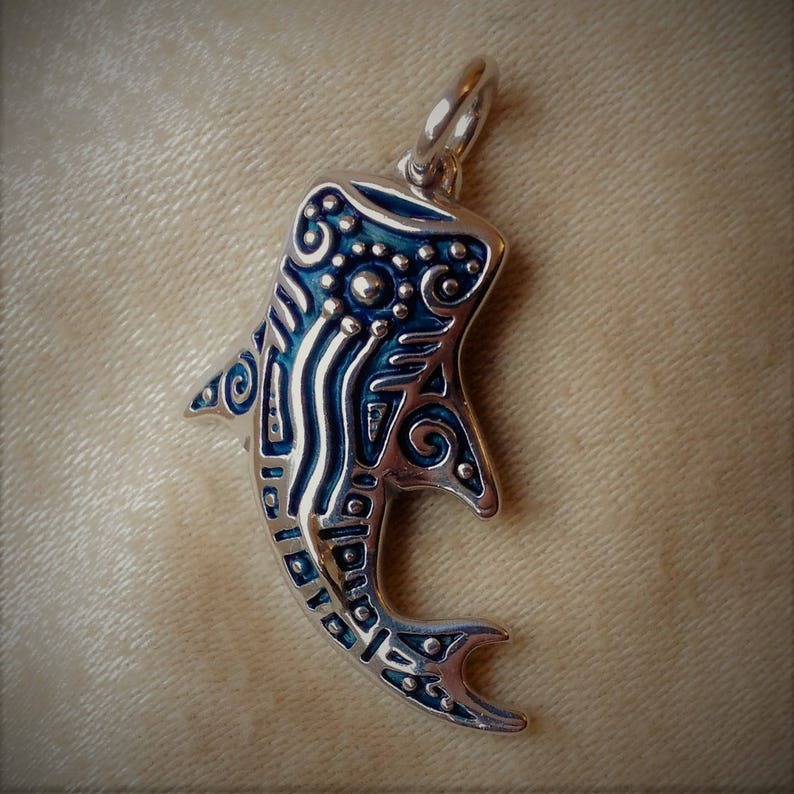 This sterling silver whale shark pendant has been plated with rhodium (a metal more precious than platinum) and has been decorated with a blue patina reminiscent of maritime tattoo ink. The design was inspired by the art of indigenous of coastal communities that have lived in harmony with these magnificent creatures for thousands of years. Whale Sharks are the largest of all fish growing up to 14m (46 ft) long, yet they are quite harmless to humans. Swimming with Whale Sharks is often described as the highlight of many tropical adventures. Shark necklace, silver shark, blue tribal tattoo design necklace, shark pendant. Shark tail necklace, sterling silver Shark Spirit koru jewellery design pendant. Whale Shark pendant, gold and sapphire large whale shark necklace, diving jewelry. 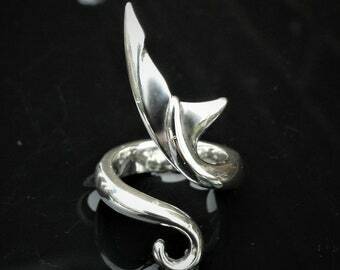 Shark tail ring, solid silver torque shark ring. UK size J, US size 5, slightly adjustable size. It's totally awesome! Perfect, and just what I wanted! This is a delightful pendant, thank you! Over the moon with my fourth addition from Adrian. His work is always so substantial, even with pieces as light as this one. I haven't taken it off since I received it. Thank you! Whale Shark pendant, sterling silver and sapphire large whale shark necklace, diving jewelry. Whale shark, gold whale shark necklace, shark with a diamond eye pendant charm. Hammerhead shark necklace, sterling silver and sapphire charm pendant. Silver shark necklace, large sterling silver and diamond shark pendant, sea life jewelry. Great White shark necklace, sterling silver and diamond large shark pendant, silver jaws shark jewelry. Shark tooth necklace, sterling silver shark's tooth charm pendant. Silver shark pendant, sterling silver and sapphire shark necklace charm, classic sea life jewelry. Gold whale tail tattoo necklace, whale fluke design pendant, jewelry or jewellery for a whale lover. Gold hammerhead shark necklace, gold and diamond jewelry, shark charm pendant.